We looked at the top 1 Ping Pong Tables and dug through the reviews from 3 of the most popular review sites including Pong Hero, Table Tennis Spot, Ping Pong Table and more. Through this analysis, we've determined the best Ping Pong Table you should buy. In our analysis of 38 expert reviews, the STIGA STIGA Space Saver Ping Pong Table placed 6th when we looked at the top 9 products in the category. For the full ranking, see below. Checkout The Best Ping Pong Table for a detailed review of all the top ping pong tables. It offers many of the features that a high-end table has, like adjustable leg-levelers, a strong powder-coated frame, and a high-quality 5/8-inch top, while also being portable enough for small spaces. I am so surprised that this is such a solid table. It is sturdy, handsome, and of good quality. Most of the possible downsides of the SStiga Space Saver have to do with quality control issues. It can be a little too susceptible for its portable nature, but it wouldn’t stop you for having fun with it. The product is found to be heavy; even it comes in two separate units here. 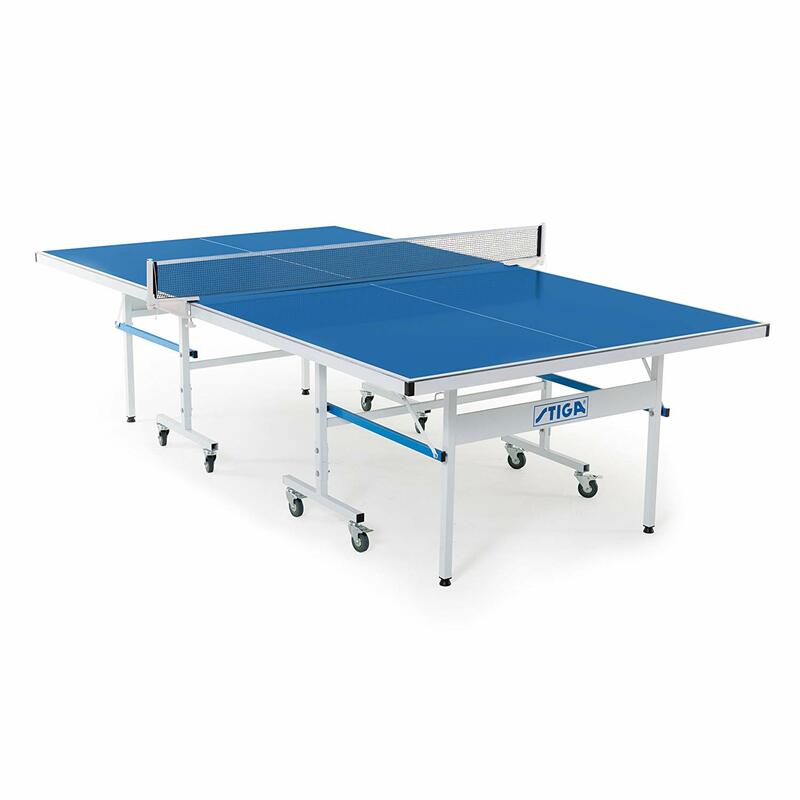 Perfect for apartments, small office spaces, or any tight space that needs an added dose of fun, the STIGA Space Saver table tennis table gives you authentic play at regulation height with a scaled down size of 71” L x 40.5” W x 30” H. This table delivers ultimate utility with the flexibility to be used for non-stop table tennis action, multi-purpose entertaining needs, or simply folded and stored away in the closet or under the bed. The table features a durable white powder-coated steel frame and 1.25” welded square steel legs. The 5/8” thick MDF tabletop includes smooth and durable silkscreen striping that is comparable in quality and finish to full sized STIGA tables. The top is supported by a 1.25” welded tubular steel apron for consistent bounce across the entire table top. The apron features durable powder coating and a silkscreened STIGA logo that resist wear and tear for a quality look that will last. Adjustable leg levelers ensure a level playing surface even when the floors are uneven. To complete the game, the STIGA Space Saver table includes a full net and post system. Whether it’s for your bonus room, your basement or your backyard, a ping pong table can provide hours of fun. But there’s no shortage of ping pong tables on the market, each with its own benefits. Before you start shopping, it can help to know what your options are so that you can make a list of the features that matter most to you. The first thing to decide is whether you’ll use your ping pong table for indoor or outdoor play. Both types of tables are available for retail purchase, so you’ll need to know where you’ll be locating the item before you buy. If you plan to just occasionally use the table outside, go with an indoor table, which tends to have a better playing surface. However, you probably won’t be able to leave an indoor table sitting in direct sunlight for extended periods of time without warping it. One of the biggest differentiators when it comes to a ping pong table is bounce. The surface of some tables gives the ball a better spring than other tables, and you’ll only notice the difference once you start playing. For best results, you’ll need a sturdy, thick table with an even surface all the way across. If you’re limited on space or you prefer to move it around, you may want to consider how your table folds up so that you can store or relocate it as needed. Some are more lightweight than others as well, making it easier to move them around or transport them across town in a vehicle. Some ping pong tables are built for serious players, whether you’re practicing for a tournament or just really competitive. Some are even built for clubs but are also available for home use. You can also find ping pong tables built specifically for casual family play. Competition-size ping pong tables are larger, giving you a bigger surface area than one you’ll just use for an occasional fun game. You may have heard ping pong referred to by the name table tennis and wondered what the difference is. The truth is, there is no difference. The first time a patent was attempted on the game was in the late 1800s, and it was referred to as table tennis. However, an English sports manufacturer attempted to make the game popular in the early 1900s, referring to it as Gossima. Competitors came out with their own versions under the names Whiff-Whaff and Flim-Flam, but none of the names stuck. Instead, the entrepreneur who named it Gossima rebranded it as “Ping-Pong,” giving it a name similar to the sound the balls make as they hit the table. Legend has it that he also traded in the cork and rubber balls originally used in the game for the lightweight celluloid ones now linked with it. If you plan to set your ping pong table up in your backyard and leave it there, your options will narrow considerably. Ping pong tables are generally used indoors, so you probably won’t find they’re built to withstand the elements. If you do need to keep your ping pong table outdoors, though, the STIGA XTR Ping Pong Table is designed specifically for that. You may find the experience isn’t quite the same as an indoor model, though. It also has a high-gloss top, which means you’ll have to deal with glare on excessively sunny days. On the other hand, the JOOLA Inside Ping Pong Table is very sensitive to heat and humidity, so it will need to not only be kept indoors but also in a temperature-controlled area. It can be tough to keep up with all your ping pong balls in between games. The JOOLA ­Rally TL Ping Pong Table comes with patented corner ball holders that handily store your balls until you’re ready to use them. If you’re looking for a ping pong table built for true athletes, the Butterfly Centerfold 25 Ping Pong Table was the official ping pong table of the 2004 and 2005 U.S. Open International Table Tennis Federation Pro Tour Championships. It’s designed for club or tournament play, so it will likely be much more table than the casual player needs. This tennis table is for those who are serious about improving their game. You’ll find this table is built to last, staying in good shape for years, even if you play all day, every day. Due to its outdoor-friendly design, you’ll get a sturdy build with the STIGA XTR Ping Pong Table, which has an aluminum composite playing surface. The bright blue color also makes it a great addition to any recreational area. It’s built with steel legs and a 6mm-thick aluminum top. The entire table is designed to resist rusting even with constant exposure to the elements. The Butterfly Centerfold 25 Ping Pong Table is built with recessed legs, offering plenty of space for someone with a wheelchair to join in the game. Although the JOOLA Inside Ping Pong Table is sturdy, it can tend to scuff with average use. Your ping pong table will likely need to be assembled before you play it. The JOOLA ­Rally TL Ping Pong Table and JOOLA Inside Ping Pong Table can be put together quickly. The STIGA XTR Ping Pong Table comes almost fully assembled, so you can set it up and start playing in minutes. If you’re limited on space, you’ll want a table that you can fold up and store away when not in use. The JOOLA ­Rally TL Ping Pong Table and JOOLA Inside Ping Pong Table both fold up and rest on a four-wheel trolley that allows you to simply roll it where you want it to go. The Butterfly Centerfold 25 Ping Pong Table has a one-piece foldable design and also has wheels for rolling it around. If you plan to move your table around quite a bit, it might be worth looking into a lightweight model like the JOOLA Inside Ping Pong Table. Its lightweight frame makes it easy to maneuver. The Butterfly Centerfold 25 Ping Pong Table, by comparison, weighs in at nearly 300 pounds. Heavier tables tend to be sturdier, though, so that’s something to consider, as well. Unless you’re serious about your ping pong game, the price will likely put you off the professional grade Butterfly Centerfold 25 Ping Pong Table, which sells for more than $2,000. You can get the JOOLA ­Rally TL Ping Pong Table, STIGA XTR Ping Pong Table and JOOLA Inside Ping Pong Table for less than $500, with the JOOLA Inside Ping Pong Table being the cheapest of all the tables.